When you think of great American cities with a unique feel, you might think of New Orleans, New York, or San Francisco. However, Santa Fe, New Mexico has a distinct vibe and is a popular travel destination. There are so many things to do and see near this great southwestern city that inspired artist Georgia O’Keeffe. The city is a cultural crossroads for Native Americans, Hispanic, and European cultures. We enjoyed a family trip to Santa Fe. Here are some can’t miss family adventures. 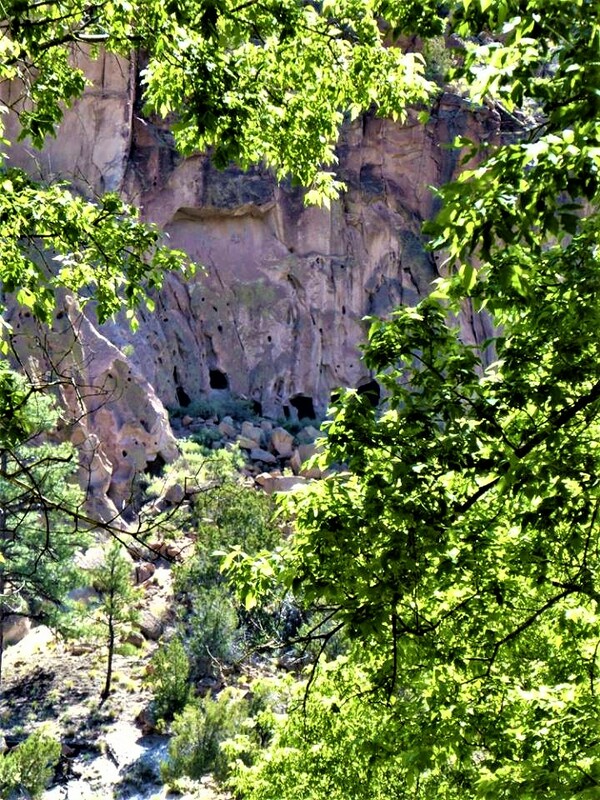 Bandelier is about an hour outside of Santa Fe. Here, you can explore ancient Puebloan dwellings and get a feel for what life was like in this region 800 years ago. The dwellings were carved out of soft volcanic tuff in the Frijoles Canyon. There are a couple of self-guided walking trails that take you to the dwellings. 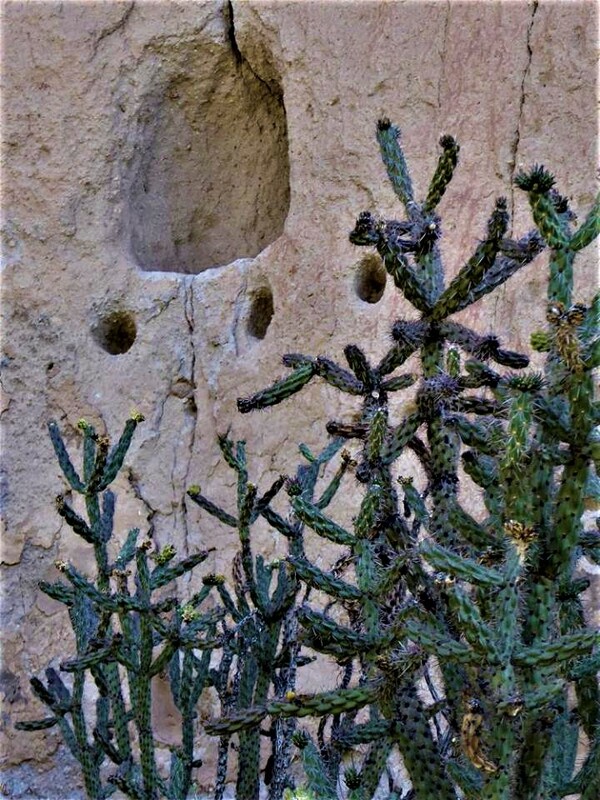 You can climb ladders to some of the houses and see petroglyphs that have stood the test of time. Our kids enjoyed exploring the structures and identifying drawings. The hike was a pleasant stroll next to a gently rolling river. We saw a few small animals during our hike, including rabbits and an Abert’s squirrel that led us along the path as if he was a tour guide. 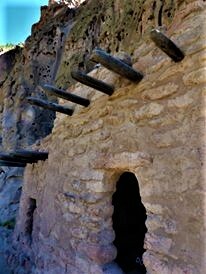 Although you can see the cliff dwellings from an easy walking path, you will need to climb up step and ladders to get inside the homes, so strollers are not a good option. Access to the park is limited. Buses transport visitors through the narrow switchback road to the visitor’s center for free. However, if you arrive at the park early enough, you can drive directly to the visitor’s center parking lot. Check the website (www.nps.gov/band) for information about the shuttles and park hours. Many other national park sites are close to Santa Fe. If Bandelier does not interest you, you can check out Valles Caldera National Preserve (www.nps.gov/vall), Pecos National Historic Park (www.nps.gov/peco), or The Manhattan Project National Historic Park (www.nps.gov/mapr). All of these parks are within a one-hour drive of Santa Fe. 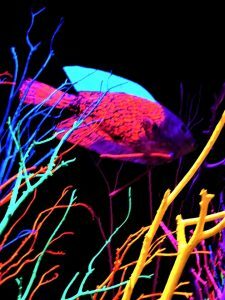 Meow Wolf is part art gallery and part interactive mystery. No words can truly describe the museum. It is a must see in Santa Fe. The line for admission was out the door when we visited, but the adventure was definitely worth the wait. 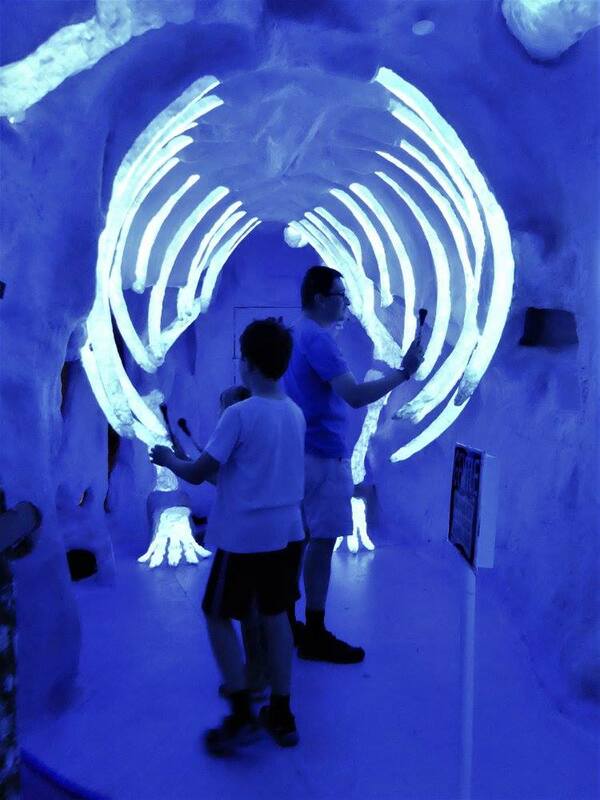 Meow Wolf currently hosts “The House of Eternal Return,” an interactive exhibit that our kids loved. How to explain it? When you enter the gallery, you enter a home filled with mystery. The family has disappeared and it is your task to discover why and where they are now. Clues to their whereabouts are placed throughout the rooms of the house. There also are secret portals that take you to strange worlds that may or may not be within our galaxy (a walk into the refrigerator or a crawl into the fireplace leads you to these worlds). The gallery is like an interactive theater where staff meander through the exhibit in costume (possibly giving hints to solve the mystery). Our family had so much fun finding clues and portals in the home. The kids ran from room to room, ever claiming that they knew where we needed to go next and that they could solve the mystery. We didn’t find out where the family disappeared, but we had three fun-filled hours exploring and creating a memory to last a lifetime. 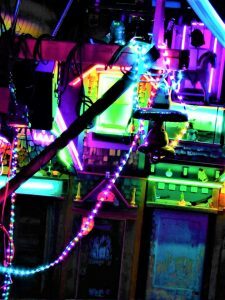 Find out more about Meow Wolf at www.meowwolf.com. In the heart of old-town Santa Fe is the Plaza and Palace of the Governors. We spent an afternoon exploring this must-see area. Street vendors line the area offering southwestern jewelry and artwork. Art galleries (including the Georgia O’Keeffe Gallery) are all within walking distance. Historic churches, including the Loretto Chapel, and fine-dining restaurants are nearby. We got all of our souvenir shopping done while here. Bring a little patience when you drive to old town. Parking is limited and traffic (including foot traffic) is plentiful. Have you been to Santa Fe? What would you recommend? Let us know. Our tale of three western U.S. Forts, including New Mexico’s Fort Union. Our attempt to sand sled at Great Sand Dunes National Park. Looks like an interesting destination for sure. I am bookmarking for future travel. I am fan of jewelry and artwork shopping so will surely check out. Thanks. The jewelry has a definite Southwestern flair. Great post! Who knew there was so much to do in Santa Fe! We really want to go back to Santa Fe. Our trip was too short and there is so much still left for us to see and do. I have travelled through Santa Fe and never thought of stopping. 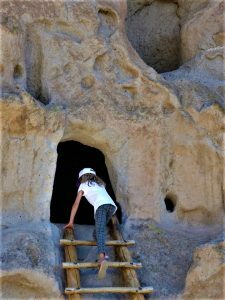 I love the description of Bandelier National Park. Definitely would enjoy the petroglyphs. Those cliff dwellings are amazing – I would love to experience them! It looks lovely and the shopping sounds good too! I love Santa Fe! Such a beautiful city with unique culture and delicious food! 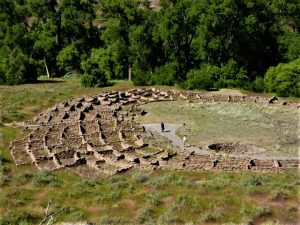 I hadn’t heard about Bandelier though, I wish I’d visitied! I love the old pueblo homes and this is definitely on the must list for my next trip to New Mexico. This looks like so much fun – cave dwellings are so wonderful to explore! And the surrounding area looks awesome, as well. Great writeup! 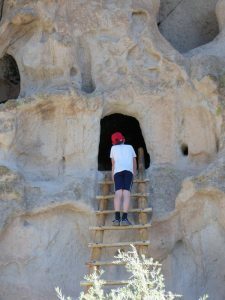 The Bandelier National Monument seems like a very cool place to explore, a nice place for a lil trip, looks like you had a great time! Bandelier looks really cool! We went to Mesa Verde a couple of years back, and really enjoyed the funky buildings and structures built into the cliff walls. Mesa Verde is one of our favorite places. But Bandelier is not far behind. 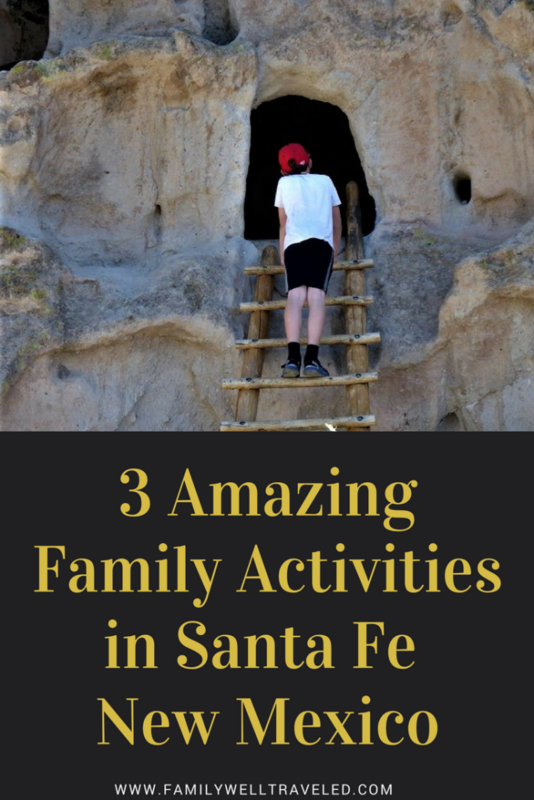 I wouldn’t think of Sante Fe at first for an entertaining family vacation, but looks like it was the perfect spot. Its always nice to be able to explore outside! Yes, exploring outside is amazing. We were surprised by how much there was for families to do as well.